Draft: 2000, Atlanta Braves, 1st rd. He and his wife, Jenny, reside in St. Simons Island, Ga., with their four daughters, Baylie Grace (9/10/06), Morgan Addison (10/22/08), Macy James (11/11/11) and Sadee Faith (12/28/15)...Graduated in 2000 from Glynn Academy in Brunswick, Ga....Named the Gatorade Player of the Year in Georgia in 2000, when he was also an All-State selection in football....As a football player, was named All-State as a place kicker and All-Region as a wide receiver in 1999....Signed college letter of intent to play baseball at Georgia Tech...Originally selected by Atlanta in the first round (29th overall) in the June, 2000 First-Year Player Draft...Voted by his teammates as recipient of the Darryl Kile award in 2008...He and his wife formed Waino's World, Inc. in 2013, a non-profit fantasy football charity league in which proceeds from the event support basic human needs...The charity was renamed Big League Impact in 2014 and has raised over $1 million since its inception, supporting both Operation Food Search and Water Missions International each year...Signed the largest contract for a pitcher in franchise history on March 28, 2013, when he inked a five-year deal that carried him through the 2018 season. • Signed a one-year free agent deal for the 2019 season...Hobbies include gardening, golf, and fishing. Made eight starts in an injury-shortened season, four of which came in September...Missed a total of 129 games with three stints on the DL: left hamstring strain (3/26-4/4) and right elbow inflammation (4/20-5/12 and 5/14-9/9)...St. Louis was 4-4 in his starts. Since 2016, the Cardinals have sported a 41-24 record in his appearances...Pitched at least 6.0 innings on three occasions, and 7.0 innings once (two quality starts)...Threw his curveball 35.8% of the time (262 of 732 total pitches), limiting the opposition to a .152/.146/.197 slashline...Activated on 4/5 and started the Cardinals home opener vs. Arizona (the 5th of his career)...Took the loss after tossing 3.2 innings, his second-shortest home Opening Day start (2012 vs. Chicago)...Passed career 1,900 innings pitched in his 4/11 start vs. Milwaukee, becoming the 15th active pitcher to do so...Earned his first win of the season in a 5-3 victory at Chicago (4/17) at Wrigley Field, allowing one unearned run with five strikeouts in 5.0 IP. Temperature at first pitch was 35°....Marked his 15th career win vs. the Cubs (T10th all-time in Cardinals history) and his 11th career win at Wrigley Field (3rd all-time in Cardinals history)...Reached 1907.1 career innings in 4/17 start at CHI, passing Slim Sallee (1905.1) for 6th all-time in franchise history...Made six rehab appearances across three levels (8/13-9/1) while recovering from right elbow inflammation...Scattered 12 hits with 23 strikeouts over 17.0 scoreless IP between Palm Beach (High-A) Springfield (AA) and Memphis (AAA)...Activated from the 60-day disabled list (right elbow inflammation) on 9/10 vs. Pittsburgh and made his first start for St. Louis in 121 days. Allowed four runs in 5.0 frames in the Cardinals' 8-7 comeback win...Surpassed Todd Worrell (1985-89, '92) with his 349th career game, moving into 8th place all-time in Cardinals history. Struck out Corey Dickerson (swinging) for his 1,600th career strikeout...Struck out season-high nine batters over 6.0 scoreless frames in a 5-0 win over the Dodgers at Busch Stadium on ESPN Sunday Night Baseball (9/16). Has pitched 6.0 or more innings in 12 consecutive starts vs. the Dodgers (8/10/07-present), currently T3rd-longest active vs. Los Angeles and trailing Curt Schilling (19) and David Cone (16)...Became the first pitcher to throw 1,000 career innings at Busch Stadium III on 9/16, and the 5th Cardinal to throw 1,000 innings at home stadiums, joining Bill Sherdel (1,087.1 at Sportsman's Park), Jesse Haines (1,554.0 at Sportsman's Park), Bob Gibson (1,182.0 at Busch Stadium II) and Bob Forsch (1,402.1 at Busch Stadium II)...Logged a season-high 10.0 inning scoreless streak from 9/1-9/22...Made four starts in September, striking out 25 in his 22.1 innings pitched while going 1-1 with a 4.84 ERA (Cardinals were 3-1)...Despite making fewer September starts than his teammates, finished 3rd on the team in innings pitched and strikeouts. Named National League Louisville Silver Slugger award winner, his first career. Co-led Major League pitchers in RBI (11, Carlos Martinez) and runs scored (7), ranked T2nd in extra-base hits (4) and home runs (2), T4th in doubles (2), and T7th in hits (10) ... Shared the team lead in wins (12) while making 24 appearances (23 starts) during an injury-shortened season ... Was 8-1 with a 3.08 ERA in 11 home starts (64.1 IP). His .889 home win pct. ranked T2nd in the N.L. Was 5-0 with a 1.16 ERA (31.0 IP/4 ER) in five day starts at home ... Was one of 12 N.L. pitchers to record a perfect 1.000 fielding percentage (37 total chances) ... Won 10+ games prior to the All-Star Break for the 5th time in his career despite beginning the year with three-straight losses for the the third time (2012, 2016-17) in his career ... Fanned Jacoby Ellsbury (4/16 at NYY) for his 1,500th career strikeout; part of a strike-them-out, throw-them-out double play as Yadier Molina nabbed Aaron Hicks attempting to steal second base ... Joined Bob Gibson as the only Cardinals pitchers in history to reach 1,500 strikeouts. Is one of 24 active pitchers with 1,500 strikeouts ... Collected career win No. 135 at MIL on 4/21, pushing him past Dizzy Dean (1930, '31-37) for 6th place on St. Louis all-time leaderboard ... Matched career-high 4 RBI in win 4/21 at MIL (2nd of career, 9/20/16 at COL), highlighted by go-ahead, 2-run HR into leftfield second deck off Wily Peralta. Also added two-run single for his 19th career 2-hit game (9th all-time among Cards pitchers). The only other Cardinals pitcher with two wins in which he had at least four RBIs was Bob Gibson, (four times) (Elias) ... Picked up 2nd straight win in Game 2 of St. Louis 4/27 doubleheader sweep of TOR, while passing Harry Brecheen's (1940, '43-52) 1790.1 innings pitched for 8th all-time in Cards franchise history ... Was 3-0, 2.64 ERA (30.2 IP) in five May starts, one of five pitchers with perfect win pct (min 4 GS) ... Allowed one run over a 4-start stretch (26.1 IP, 0.34 ERA) from 5/14-6/1 that included a 16.1 IP scoreless streak ... Had six-game win streak 4/21-6/1 which was tied for the longest win streak in National League at the time ... Underwent arthroscopic surgery on 10/3 to trim a small piece of cartilage from his right elbow (same procedure following 2014 season) ... For the third straight year, named Cardinals nominee for the Roberto Clemente Award, which recognizes a player from each MLB Club who best represents the game of Baseball through extraordinary character, community involvement, philanthropy and positive contributions, both on and off the field. Made a team-leading 33 starts, his most since 34 starts in 2013...Ranked among National League leaders in batters faced ( 847, 5th), innings pitched (198.2, 7th) and starts (T3rd). Also paced N.L. pitchers in hits (220) earned runs (102) and doubles allowed (48)...Notched 8th career season with 10 or more wins, tying Bill Sherdel (1920-29) and Bill Doak (1914-22) for 4th-most in Cards history (Bob Gibson leads with 14). Has posted 10 or more wins in each season with 10 or more starts...Pitched at least 6.0 innings in 21 of 33 starts, and 18 were quality starts. St. Louis was 22-11 in his starts...Finished 7th among N.L. pitchers with a 55.6% stolen base rate, allowing five steals in nine attempts...Named 2016 Rawlings National League Gold Glove Award finalist. Was one of six qualified N.L. pitchers to record a perfect 1.000 fielding percentage (41 total chances) (min. 30 TC/162 G)...Ranked 3rd in the N.L. in double plays induced (27) and 2nd in GDP/9 IP (1.22)...Ranked 11th among National League pitchers in fewest HR/9 IP (1.00), yet yielded a careerhigh 22 home runs. Did not allow a home run over a nine-start stretch from 6/3-7/21 (66.2 IP), the longest homerless streak by a N.L. pitcher in 2016...Went 5-0 over a seven-start span (4/27-5/28), his five-game win streak tied for the longest by a Cardinal in 2016 (Wacha)...Allowed seven runs (six earned) over 5.0 IP for a win in STL's 12-10 victory at Angels (5/12), marking the 13th career outing allowing seven or more runs, but first occurance picking up the win (Cards are 2-11). It was also just the 4th time since 1984 a Cardinals starter had allowed seven or more runs and still received the win; since 1931, only teammate Lance Lynn (2013) did so pitching 5.0 innings as well...Went 3-1 with a 1.77 ERA (35.2 IP/ 7 ER) in July, ranking 7th in MLB ERA during the month...Was one of 18 N.L. pitchers to record a complete game shutout, firing a three-hit shutout (120 pitches) vs. MIA (7/16)...Posted an 18.0-inning scoreless streak from 7/7-21, the longest by a Cardinals pitcher in 2016...Allowed a season-high 26 runs (21 earned) in six August starts (31.0 IP), his most allowed surpassing 24 from August 2014...Picked up 14th career win vs. Milwaukee on 9/10 holding the Brewers to a run on six hits in 8.0 innings. His 14 wins over Milwaukee lead all active pitchers and are his most vs. an opponent in his career...Led Major League pitchers in RBI (18), doubles (7), extra-base hits (10). Ranked T1st in triples (1), T3rd in home runs (2) and T6th in hits (13)...Ten of his 13 hits went for extra bases (7 doubles, 1 triple, 2 homers)...Became first Cards pitcher in franchise history to record four three-RBI games in one season, and the first in MLB since Don Newcombe had four in 1955 (Wes Ferrell, 5, 1931, MLB record). His 18 RBI were most by Cards pitcher since Bob Gibson's 19 in 1965 and 1970...Hit a three-run triple in 4/27 outing at ARI, the second three-bagger of his career (last 10/2/09 vs. MIL, Braden Looper)...Doubled and slugged his 7th career home run vs. PHI (5/2), a three-run shot into Big Mac Land. The last Cards pitcher with a homer, double and 3 RBI in a game was Chris Carpenter at CIN (10/1/2009)...Recorded an extra base hit in four straight plate appearances (triple, home run, double, double) over three-game period (4/27- 5/7) to become the second pitcher since 1900 to record an extra-base hit in four consecutive at-bats (Snake Wiltse, Philadelphia A's, 8/10/1901 vs. the Senators, all in one game ). (Elias)...Hit a pinch-hit, game-winning, two-run double in the 12th inning of STL's extra-inning 9-3 win over PIT at PNC Park (6/10)...With double on 9/5 at PIT, became first pitcher in modern MLB history to produce extra-bases on nine consecutive hits, passing record owned by current teammate Mike Leake, who recorded extra bases on eight straight hits from 2014-15 (w/ Cincinnati) (Elias). While earning a win in his start at COL on 9/20, was 2-for-2 at the plate with a double and career-high 4 RBI. Became the 25th pitcher in Cardinals history with 4 or more RBI in a game and the most recent since Jake Westbrook (8/31/2011)...Named the Cardinals 2016 nominee for the prestigious Roberto Clemente Award, which recognizes a player from each MLB Club who best represents the game of Baseball through extraordinary character, community involvement, philanthropy and positive contributions, both on and off the field. Made four starts before landing on the disabled list with a ruptured right Achilles. Was ranked among the National Leagueleaders with a 1.44 ERA at the time of the injury…Injury occurred while batting during his 4/25 start at MIL (top of the 5th)…Missed 142 games before being activated on 9/30, and appearing in relief for one inning allowing one run. It was his first relief app. since Game 5 of the 2006 World Series (10/27/06) and his first regular season relief appearance since 9/30/06 vs. MIL…Was the Cardinals Opening Day starting pitcher at Wrigley Field on 4/5 (his 4th career Opening Day start) and made the home opening start at Busch Stadium vs. MIL on 4/13…Had a career-high scoreless streak of 27.0 innings snapped vs. MIL (4/13), dating back to 9/12/14 vs. COL…Hurled 6.0 scoreless innings, 5 hits, no walks, 6 strikeouts at CHI (4/5) in the season opener on ESPN Sunday Night baseball…Made his 3rd start of the season on ESPN Sunday Night Baseball 4/19 vs. CIN, tossing 8.0 innings allowing one run in a 2-1 Cardinals win, posting a game time of 2:02, the fastest game of the Cardinals season…Did not allow a run in 10.0 innings on the road (8 H, 0 BB, 10 K's) as a starting pitcher…Made three relief appearances over the final five games of the regular season, two scoreless. Finished 3rd in the N.L. Cy Young vote (Kershaw & Cueto) and 8th in N.L. MVP vote...Started 32 games, marking his 6th career season and 3rd consecutive to start 30 or more games...Posted a 20-9 record, his second season with 20 wins (2010). Became the first Cardinals pitcher since Joaquin Andujar (1984-85) to win 20 games in two different seasons...Prior to Andujar it was Bob Gibson (1965-66, 68-70) in five seasons...Had 12 starts with 7.0 or more scoreless innings, the most by an MLB pitcher since 1916...Has 39 wins over the past two seasons (2013-14), tied with Max Scherzer for the most in MLB...His 53 wins, 98 games started and 667.1 innings pitched since 2012 are the most among NL pitchers...Among NL leaders, ranked T2nd with 20 wins, 3rd with his 2.38 ERA, 2nd with 227.0 IP, T15th with 179 strikeouts, 2nd with 5 complete games and T1st with 3 shutouts...Was one of three N.L. pitchers with a one-hit and a two-hit complete game (Madison Bumgarner & Andrew Cashner)...His 18 complete games since the start of 2010 are tied with Roy Halladay for the most over that period. Has 9 shutouts since the start of 2010, tied with Clayton Kershaw for the most in that period...Hurled an N.L. co-leading three shutouts in 2014, his highest career single-season total...Ran off three scoreless inning streaks of 20.0 or more innings pitched. Relief pitcher Wade Davis (KC) was the only other pitcher with two streaks of 20.0 or more...His 25.0 inning scoreless streak (4/12-27) ranked 4th longest in N.L. The streak was snapped on 5/2 at CHI, 1.0 IP shy of his career-high streak of 26.0 scoreless innings...Joined teammate Lance Lynn as the first Cardinals pitchers with 175 or more strikeouts in three consecutive seasons since Bob Gibson (1970-72)...Hardest starting pitcher in the N.L. to homer off (0.40 HR/9 IP). Had allowed just 7 home runs all season before giving up 3 in his 9/2 start vs. PIT...Ranked 3rd among N.L. pitchers with 1.03 WHIP, 9.56 baserunners/9 IP, and 4th with a 7.30 hits/9 IP...Induced 24 double plays ranking T1st among N.L. pitchers and was 7th with 0.95 GIDP/9 IP. His 73 double plays since 2012, is tops in in MLB...Recorded monthly ERAs under 2.00 four times: April (1.42), June (1.16), July (1.62), September (1.38)...Ranked T2nd among MLB pitchers with 13 hits and T3rd with 6 RBI. Posted his 2nd career 3-RBI game vs. PIT (9/2)...Ranked T1st in NL with 11 road wins (11-6); 1st in road ERA (1.72)...Named to his 3rd All-Star game by vote of N.L. players and was honored as the starting pitcher, the 1st Cardinal since Chris Carpenter in 2005 to draw ASG start. (1.0 IP, 3 runs on 3 hits with 2 K's)...Posted his 100th career win with a 1-0 blanking of the Reds on 3/31 in his 3rd career Opening Day start. Worked 7.0 scoreless IP, fanning nine, at Great American Ball Park...Did not allow an extra base hit (9 singles) for 25.0 IP from 6th inn. on 4/12 vs. CHI to the 1st inn. on 5/2 at CHI...Joined Darryl Kile, Bob Tewksbury & John Denny as only Cardinals to have won 5 games in a single March/April with win #5 on 4/27 vs. MIL...Working on six days rest, threw a near perfect game on 5/20 vs. ARI, facing just one over the minimum. Pitched a complete game, one-hit shutout as he walked none and struck out nine in the 5-0 win. The one-hit CG was a career low...Moved into sole possession of 8th place on the STL All-Time wins list (107) with his 5/25 win at CIN...Earned N.L. co-Player of the Week honors 5/26 for his 2-0, 0.00 ERA week, leading the N.L. with 21 K's & 17.0 IPs, which included a complete game, 1-hitter (28 BF), season-high 12 strikeout game and a start of 8.0 scoreless IP...Snapped his 20.0 inning scoreless streak (5/13-30) with a run in the 1st inn. in his 5/30 start vs. SF...Had a 2-1 record with a 1.16 ERA in four June starts. His June ERA was fourth best in the National League...Allowed just 4 ER in his final six starts (0.81 ERA) leading into the All-Star break...Was 3-1 with a 1.62 ERA in five July starts. His 1.62 ERA ranked 4th among N.L. pitchers...Won a season-best five consecutive games over his final five starts, including two complete games...Pitched his 5th complete game and second in three starts 9/17 vs. MIL. Posted his ML-high 3rd CG shutout (9th career) while throwing 102 pitches. Broke up no-hitter with single in the 6th. His six career complete games are the most against the Brewers passing Greg Maddux...Named the N.L. Pitcher of the Month for September. His five Sept. wins were T1st in the N.L. and his 1.38 ERA ranked 6th...His 5-0 September record was the first month he'd won 5 or more games with no losses. He was 5-1 in Sept. of 2012...Underwent athroscopic surgery on 10/24 to trim a small piece of cartilage from his right elbow...Made 3 starts in the 2014 postseason and was 0-1 with a 5.63 ERA over 16.0 innings with 14 strikeouts...received a no decision in Game 1 of the NLDS at LAD (10/3) exiting after 4.1 innings allowing 6 runs on a career postseason high 11 hits in a game the Cardinals rallied to win, 10-9...took the loss in Game 1 of the NLCS vs. SF (10/11) surrendering three runs (2 ER) over 4.2 innings...fired 7.0 strong innings at SF (10/16) in Game 5, allowing two runs on four hits with seven strikeouts in his lowest pitch count of the postseason at 97 pitches. Made a team-leading 34 starts, tying his career high (2009) and was one of four pitchers in MLB to make 34 starts (T1st)... Winner of his 2nd career Rawlings Gold Glove award, as he flawlessly handled 61 total chances (1st in N.L.)... Finished 2nd in the National League Cy Young vote (Kershaw)... Finished the season T1st in the National League with 19 wins (Zimmermann, WSH)... Topped the Majors with 241.2 innings pitched and ranked 3rd in the National League with 219 strikeouts... Was 7th in the league with his 2.94 ERA, his 3rd season with a sub-3.00 ERA (2009: 2.63 & 2010: 2.42)... Had 10 starts wtih no walks. Walked just 35 batters, 3rd fewest among M.L. starters with 200+ IP (C. Lee, PHI 32 in 222.2 IP & B. Arroyo, CIN 34 in 202.0)... Among National League pitchers, ranked 2nd in BB/9 IP (1.30), 6th in HR/9 IP (0.56), 7th in WHIP (1.07) and T1st in ShO (2)... Had an MLB best 5 complete games and T1st with 2 shutouts (Kershaw & J. Zimmerman)... Selected to his 2nd All-Star Game, voted in by players, but did not make an appearance in the game... Has 1,127 strikeouts and moved into 2nd on the all-time Cardinals list on 9/7, passing Dizzy Dean (1,095)...passed Chris Carpenter (1,085) for 3rd on STL all-time strikeout list on 8/23... Did not walk a batter in first 34.2 IP to start the season season. Since 1900 it is the 2nd-longest STL streak: Slim Sallee in 1913, no walks in 1st 40.0 IP... Pitched a CG 4-hit shutout with 12 K's vs. MIL on 4/13. Became the 1st Cards pitcher since Bob Gibson (6/17/70) to pitch a CG shutout with a strikeout in every inning (tied career high)... Voted NL Pitcher of the Month for June; 4-2, 1.77 ERA in six starts... Recorded his 1,000th career strikeout 6/13 at NYM (D.Wright). Was the first N.L. pitcher to 10 wins, doing so at NYM on 6/13... Won his 15th game with a 3-1 complete game win over ATL on 8/23, his 5th CG of the season,16th career. It was his 50th career win at Busch Stadium III... Made 5 starts in the postseason and had a 2-3 record, 2.57 ERA...his 2.57 ERA ranked 2nd among 5-game starters during the postseason (Lester-BOS 1.56) and was T3rd among pitchers with 3 or more starts (Verlander-DET 0.39, Lester, Greinke-LAD 2.57)...led the team with 34 strikeouts, tied for the most among all pitchers (Scherzer-DET) and T9th-most in MLB singleseason history...went 2-0 in the Division Series vs. PIT, earning the win in both Game 1 and 5...pitched 7.0 innings in Game 1, allowing only 3 hits and one run (solo HR), striking out 9 (0BB)...pitched a complete game in Game 5 win, allowing one run on 8 hits in the decisive 6-1 win...allowed 2 runs on 6 hits (0BB, 5K) in his lone start in the League Championship Series (Game 3), a 3-0 loss at Los Angeles Dodgers...started Game 1 of the World Series at Boston and was charged with the loss, allowing 5 runs (3ER) in 5.0 IP...also started Game 5 and again took the loss, allowing Boston's 3 runs in the 3-1 defeat (7.0IP, 8H, 3R, BB, 10K). Tied for the N.L. lead in home wins with 10 (Bumgarner, Cueto, Dickey), going 10-6 with a 3.73 ERA in 17 home starts. His 184 strikeouts led the Cardinals and ranked 13th in the N.L. He was 12th in strikeouts/9.0 IP(8.34) and 12th in K/BB ratio(3.54). Was T16th in wins (14) and T2nd in complete games (3)&shutouts (2). Ranked 6th in the N.L. in ground ball pct (66.0) & in ground ball/fly ball ratio (1.94). His 9 unearned runs ranked T8th in the NL. Went 5-1 in August, one of four NL pitchers to post five wins. Recorded two of his three complete games in August. Hit a solo HR, his 6th career, on 9/5 vs. the Mets. Committed just one error (6/12 vs. CWS) in 35 total chances for a .971 fielding pct. In five of six seasons has committed one error or less (most was 2 in 2007). Made his first start since 9/24/10 on 4/8 at MIL pitching 5.2 innings and allowing three runs in the loss. His first three starts of the season were all under 6.0 innings -the first time in his career ever to have three starts in a row that short. Started the season 0-3 for the first time in his career. Posted a 10-7 win vs. PIT on 5/1 in his first win since his final start of 2010 season (9/24 at CHI). Pitched his best game since coming back from his 2011 surgery on 5/22, throwing a complete game 4-0 shutout over SD.Allowed just four hits, walked one and had nine strikeouts. Pitched his 2nd complete game of the season on 8/4 vs. MIL, allowing five hits and one run (1st inning), while walking none and striking out seven in the 6-1 win. Also had two hits, including the GWing RBI with an RBI double in the 3rd. Threw his 3rd complete game of the season, a five-hit shutout vs. Houston on 8/21. Struck out a season-high 12, matching his career high. 2012 POSTSEASON: Started three games during the playoffs...started Division Series Game 1 vs. Washington and struck out 10 over 5.2 IP allowing a single run but did not get a decision in the 3-2 loss...allowed 6 runs in 2.1 innings in his Game 5 start before team came back for dramatic 9th inning 9-7, come-from-behind win to send the team to the League Championship Series...earnedthe win in LCS Game 4 vs.San Francisco...went 7.0 IP and allowed one run on four hits with five K's...it marked the first LCS start in his career. His season ended during Spring Training when it was announced he would need elbow ligament replacement surgery...Missed the entire season after surgery on his right elbow on 2/28 by team physician, Dr. George Paletta...Club exercised the options on his contract on 10/14 for both the 2012 and 2013 seasons. Finished another strong season, leading the Majors in several categories while posting his first 20-win season...Named to his first All-Star team and threw a scoreless 7th inning while fanning two in the N.L. win...His 2.42 ERA ranked 2nd in the National League, the 2nd-straight year he finished with an ERA under 3.00...Collected 20 wins for the first time in his career, 2nd only to R. Halladay (21) & had five complete games, also 2nd in the N.L...Pitched 230.1 innings, 3rd in the N.L. and his 213 strikeouts ranked 4th. The 213 K's were one more than his previous career high set in 2009 (212) and the most by a Cardinal since C. Carpenter fanned the same number in 2005...Set a career low with opponents hitting just .224, 7th among N.L. hurlers. Was also T7th as opponents batted just .200 with runners in scoring position...Had two shutouts, 6/4 vs. MIL and 8/6 at FLA, matching several Major League pitchers for 2nd most...Recorded 25 quality starts T1st among N.L. pitchers, beginning the season with seven-straight QS...Had a Major League record 28 consecutive quality starts at home that was snapped on 9/4 vs. CIN (five runs (2 ER) in 5.0 IP)...Had a 26.0 scoreless innings streak from 7/4-27 and a 25.0 inning scoreless streak from 8/1-18. The streaks were 5th and T7th longest in the N.L., respectively...Went 19-0 when receiving four or more runs of support...Was 12-3 with a 1.78 ERA (3rd in N.L.) when pitching at Busch (16 starts). He didn't lose a home start until 8/18 vs. MIL and tied for Majors lead in home wins. Was 8-8 in 17 road starts with a 3.08 ERA (9th)...His 1.89 day ERA was the lowest among N.L. pitchers, and had an 11-3 record in 15 daytime starts...His 8-0 April winning streak in 12 starts dating to '08 was snapped on 4/24 at SF. It was the longest April winning streak among active pitchers (Elias)...Threw his first career complete-game shutout 6/4 vs. MIL in an 8-0 win, retiring the last 18 batters...Earned his 20th win in his last start, 9/24 at CHI. He became the 4th Cardinals pitcher to record 20 wins under Dave Duncan's watch, joining Chris Carpenter, Matt Morris and Darryl Kile...Pinch hit three times in 2010 (0-3). Did not hit a HR for the first time during a full Major League season. Finished 3rd in N.L. Cy Young voting and had the most first-place votes in what was the 2nd-tightest race in the history of theaward...Was named the National League's Outstanding Pitcher of the Year by MLBPA Player's Choice Awards..Led the league in wins (19) and innings pitched (233.0) and had a career high 34 starts...Was first St. Louis pitcher to lead league in innings pitched since Joaquin Andujar in 1984 (261.1)...His 2.63 ERA was 4th-lowest in the league. His 2.05 home ERA ranked 4th and 2.39 night ERA 2nd in the league...Was baseball's first pitcher to 16, 17 and 18 wins...His 212 K's led all STL pitchers and ranked 4th in NL...Went 7-7 with a 2.05 ERA in 19 starts at Busch Stadium. Was 12-1, 3.39 ERA in 15 starts on the road - most road wins since Carpenter (12-2005)...Had a 26-start streak of working at least 6.0 IP snapped on 9/4 at PIT (5.0 IP), the longest Cards streak since Chris Carpenter had 28 games of 6.0 IP or longer from 4/16-9/13/05. Also had his 13-straight QS streak snapped on 9/4...In his last 27 starts (191.2 IP/48 ER) posted a 2.25 ERA from May 16 on - 2.03 ERA if you take away 9/4 start at PIT (6 ER)...Went 4-1, 1.17 ERA in six July starts and was 11-3 with a 1.90 ERA (128.0 IP/27ER) in 18 starts after July 1...Cards were 16-6 in his last 22 starts, scoring two runs or less in four of the six losses...Struck out 12 batters & allowed only one run in 9.0 innings, but took a no-decision in the Cards' 2-1 win vs. SF on 7/1...the last pitcher who did not win a game in which he threw at least 9.0 innings, gave up no more than one run and struck out at least 12 batters was Carlos Zambrano, on 7/22/05 in St. Louis...Hit his 2nd HR of the season, 5th career, in 8/14 win over SD. Pinch hit six times for Tony La Russa (0-5, SH). Went 11-3 with a 3.20 ERA in 20 starts during an injury shortened season...Cards went 15-5 in his 20 games started...Was on the disabled list and missed 65 games from 6/8-8/22 due to a right middle finger sprain...Made three rehab appearances, two at Memphis (AAA) and one at Springfield (AA) and combined to allow five runs on 12 hitsin 8.1 IP while walking two and fanning 10 (5.40 ERA)...Was tabbed as the team's Opening Day starter 3/31 vs. COL, and pitched 3.0 innings before rain forced a postponement andcanceled out a 5-1 lead...Opponents batted just .192 (30-156) off him during six starts, 4/16-5/12...Opponents batted just .192 (30-156) off him during six starts, 4/16-5/12...Was forced out of his start on 6/7 at HOU after 5.0 IP with a sprain to his right middle finger...Has a current and career-high 6-game winning streak that began on 6/7 at HOU...Went 5-0, 3.35 ERA (40.1 IP/15 ER) with 15 BB & 29 K in his seven starts after coming off the DL...Was 7-1 with a 2.63 ERA (78.2 IP / 23 ER) in 11 starts at home...Two of his three losses came on the road over nine starts (4-2, 4.05 ERA)...Was a perfect 3-0 in three starts with a 1.64 ERA vs. the N.L. East...3-1 with a 2.23 ERA in five starts vs. the West and 5-2,3.88 in 11 Central-division starts...Pitched 6.0 or more innings in 15 of his 20 starts, over 6.0 IP in 11 starts and 8.0 innings or more in five of 20 starts...STL scored 107 runs when he pitched for a team-high 5.4 run support avg. After a successful season as a reliever, converted back to a starter and was one of team's most consistent and reliable... his 14 wins were the most ever by a Cardinals pitcher in their initial season in a starting role...with his start on 9/19 vs. PHI became the first Cardinals pitcher to start 30 games in his first season as a starter since teammate Rick Ankiel did so in 2000...Cardinals won 19 of his 32 games started, tops among the team's starters...was 7-5 after the All-Star break with a 2.71 ERA and in seven road starts after the break, was 5-2 with a 2.60 ERA...had quality starts in 10 of his last 12 outings...went 2-1 with a 1.87 ERA (33.2 IP / 7 ER) over his last five starts at Busch Stadium...led the team with 136 total strikeouts...finished 2-3 with a 3.69 ERA in six June starts, in July was 4-1 with a 3.09 ERA and lowered his August ERA to 2.00, with a 2-1 record in five starts...batted .290 and was 3-for-5 (.600) as a pinch hitter...started the inaugural Civil Rights exhibition game on 3/31 at AutoZone Park in Memphis and earned the win vs. CLE...made his first major league start on 4/6 at HOU and earned a 4-2 win...posted his first CG effort of his career on 8/10 vs. LA, throwing 121 pitches, in 2-1 loss...had not allowed a HR for six-plus starts, covering 47.0 IP, before Dodgers' James Loney touched him for a 2-run shot in 9th inning with the score knotted at 0-0. Rookie spent his first full season in the Majors. Led all St. Louis relievers with 23 Holds & 72 strikeouts...Ranked among NL rookie pitching leaders in ERA (3.12), opponent BA (.230) and games pitched (61)...Had 72 K's in 75.0 IP & 20 multi-K games in 61 appearances...Struck out 16 of the last 45 batters he faced over his last 11games (11.2 IP). Was 12th among all N.L. relievers in baserunners allowed (10.8) per 9 IP...Had each of the team's two saves (9/27 vs. SD & 9/30 vs. MIL) after Isringhausen went down with injury on 9/5...Worked 1.1 IP 9/22 at HOU for 23rd Hold, but had his 8.2 scoreless IP string ended when he allowed two runs in the 8th...Handled the final out in 8th inn. 9/5 at WSH, stranding two runners, for his 22nd Hold...Fanned career-high four on 8/30 vs. FLA in 2.0 scoreless innings for 21st Hold...Recorded final 2 outs in 8th 8/17 vs. CIN, stranding potential go-ahead run at 3rd. Pitched 2.0 scoreless IP on 8/4 vs. MIL...Worked a perfect 1.2 IP for 17th Hold 7/26 at COL. Allowed 5 hits & 2 runs in two appearances at CHI from 7/29-30...Allowed a solo HR in the 8th 6/30 vs. KC that tied the game for his 2nd BlnSv on the year. Fanned 3 in 2.0 IP 6/27 vs. CLE...Suffered his first blown save 6/10 at MIL, allowing game-tying run in the 7th...Earned win on 5/24 at SF and HRed on the first pitch of his 1st career at-bat, as he joined Hoyt Wilhelm (NY Giants-1952) &John Montefusco (SF Giants-1974) as only relievers to hit their first HR & gain win in the same game...Picked up 1st career save 5/19 at KC...walked the first batter then retired eight straight. Ended 9.0-inning scoreless streak thatspanned seven outings on 5/14 vs. ARI...Picked up first Major League win 5/9 vs. COL, tossing a perfect 8th inn...Allowed his first run of the season on 4/16 vs. CIN(HR) ending 7.2 scoreless IP streak. Tossed 3.0 scoreless innings on 4/13 vs. MIL, allowing one hit...Opened the season on a Major League roster for the first time in his career. Earned his first taste of Major League action after a solid season at Triple-A Memphis...Posted a 10-10 record, 4.40 ERAin 29 starts for the Redbirds...Led the Pacific Coast League with 182.0 IP and ranked 2nd with 147 strikeouts...His 10 wins ranked T-5th in the league...By making his 29th start of the season, Wainwright tied the Memphis club record (Larry Luebbers, 1998). The total also matched the PCL high...Also led the PCL in hits allowed (204), at-bats against (724), total batters faced (793) and wild pitches (12)...Won his last three starts at Memphis and allowed just three earned runs over his final 19.0 IP (1.42 ERA)...Was recalled to St. Louis prior to game 9/6 from Triple-A Memphis...Made his Major League debut on 9/11 vs. NY, allowing a 3-run homer (V. Diaz) in an inning of work...Logged a scoreless inning on 9/23 at MIL, his first appearance since his debut...Won four of his first six decisions spanning 10 starts in the months of April and May (4-2, 2.43 ERA, 66.2 IP / 18 ER)...Struggled in 12 starts in June and July, with a combined 2-6 mark and 5.71 ERA (75.2 IP / 48 ER)...Was stingy with two outs, limiting opponents to a .247 batting average with runners in scoring position and two outs...Held opponents to 29 hits in 125 at-bats (.232) with runners on base and two outs...Allowed seven hits in 16 at-bats (.438) in bases loaded situations...Pitched a season-high 8.0 innings on 7/2 at Nashville, allowing a run on five hits while fanning six, to snap a personal three- game losing streak...Struck out 12 batters on 8/20 at Iowa in a 4-3 loss...walked two and allowed four runs (three earned) on seven hits in 7.0 IP...Was named the PCL's Pitcher of the Week for the final week of the season...in two starts, he posted a pair of wins and an 0.75 ERA (12.0 IP / 1 ER) while striking out 14. His first triple-A season started in fine fashion before elbow discomfort forced him to discontinue throwing in June...Returned to action during the Arizona Fall League season, appearing in four games with Mesa Solar Sox...Went 2-0 with a 2.35 ERA in his first four starts for Memphis, striking out 23 while walking just six in 23.0 IP...Posted a 3-0 win over Albuquerque in his 4/9 season debut, allowing just two hits in 6.0 IP. Improved his record to 3-1 with a win over Portland on 5/13 (7.0 IP/1 ER)...Final win came on 6/2 vs. Colorado Springs, a game in which he fanned a season-high nine batters...Made his final start for Memphis in a loss to Iowa on 6/7 (5.1 IP/6 ER)...Was 0-1, 5.23 ERA in four starts for Mesa in Arizona Fall League action, striking out 12 batters in his 10.1 IP...For his minor league career, Adam has fanned 624 batters in 602.2 IP. Pitched his first season at the Double-A level, toiling for Greenville of the Southern League...Was named the Greenville Braves' Pitcher of the Year with a 10-8 record and a 3.37 ERA in 27 games (all starts)...In 149.2 innings pitched he walked just 37 batters while fanning 128. For his minor league career, Adam has fanned 560 batters in 539.0 IP...Ranked second in the league in starts and 10th in ERA...Earned league Pitcher of the Week honors for 8/22-28...In August he posted a 4-1 record with a 2.06 ERA. Pitching for Class-A Myrtle Beach, Adam led the Carolina League with 167 strikeouts in 163.1 IP...went 5-0 with a 2.47ERA in eight starts 5/14-6/14...allowed two or fewer runs in fivestraight starts 6/14-7/12...fanned a season-high 11 in a 4-1 winover Potomac on 6/4...surrendered only seven homers in 163.1IP...named the top prospect in the Braves' organization byBaseball America...earned roster spot in the MLB Future's Gamein Milwaukee...threw a scoreless fourth inning with a strikeout forthe USA team. Named the organizations's top pitching prospect and #2 overall by Baseball America...Named the Braves top pitching prospect by Baseball Weekly...Led the organization in strikeouts with 184; breaking Bruce Chen's Macon record and leading the South Atlantic League...Was named Best Pitching Prospect in the SAL by Baseball America...His 28 games started tied a team record and his 164.2 innings pitched were third most in M-Braves history...Recorded one walk for every 3.83 K's this season, the 13th best single season ratio in M-Braves history. In his first professional season, he dominated in the Gulf Coast League, leading to a promotion after just seven starts... Baseball America rated him the 7th best prospect in the organization and as the top prospect in the Appalachian League last season. Had a ratio of one walk for every 6.75 strikeouts...Was named Gulf Coast Braves Pitcher of the Year. Named GCL player of the week 7/17-23. 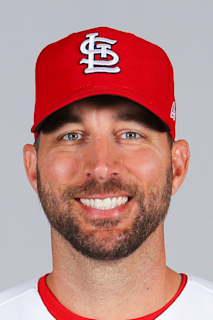 March 25, 2019 RHP Adam Wainwright assigned to Memphis Redbirds. March 25, 2019 Memphis Redbirds activated RHP Adam Wainwright. October 30, 2018 St. Louis Cardinals signed free agent RHP Adam Wainwright. October 29, 2018 RHP Adam Wainwright elected free agency. September 10, 2018 St. Louis Cardinals activated RHP Adam Wainwright from the 60-day disabled list. August 27, 2018 St. Louis Cardinals sent RHP Adam Wainwright on a rehab assignment to Memphis Redbirds. August 19, 2018 St. Louis Cardinals sent RHP Adam Wainwright on a rehab assignment to Springfield Cardinals. August 13, 2018 St. Louis Cardinals sent RHP Adam Wainwright on a rehab assignment to Palm Beach Cardinals. May 17, 2018 St. Louis Cardinals transferred RHP Adam Wainwright from the 10-day disabled list to the 60-day disabled list. Right elbow inflammation. May 15, 2018 St. Louis Cardinals placed RHP Adam Wainwright on the 10-day disabled list retroactive to May 14, 2018. Right elbow inflammation. May 13, 2018 St. Louis Cardinals activated RHP Adam Wainwright from the 10-day disabled list. May 7, 2018 St. Louis Cardinals sent RHP Adam Wainwright on a rehab assignment to Springfield Cardinals. April 22, 2018 St. Louis Cardinals placed RHP Adam Wainwright on the 10-day disabled list retroactive to April 20, 2018. Right elbow inflammation. April 5, 2018 RHP Adam Wainwright assigned to St. Louis Cardinals. September 19, 2017 St. Louis Cardinals activated RHP Adam Wainwright from the 10-day disabled list. August 18, 2017 St. Louis Cardinals placed RHP Adam Wainwright on the 10-day disabled list. Right elbow impingement. August 6, 2017 St. Louis Cardinals activated RHP Adam Wainwright from the 10-day disabled list. July 25, 2017 St. Louis Cardinals placed RHP Adam Wainwright on the 10-day disabled list retroactive to July 23, 2017. Mid-back tightness. September 30, 2015 St. Louis Cardinals activated RHP Adam Wainwright from the 60-day disabled list. October 7, 2012 St. Louis Cardinals activated RHP Adam Wainwright. November 1, 2011 St. Louis Cardinals activated RHP Adam Wainwright from the 60-day disabled list. March 25, 2011 St. Louis Cardinals placed RHP Adam Wainwright on the 60-day disabled list. Recovering from February 2011 Tommy John surgery.